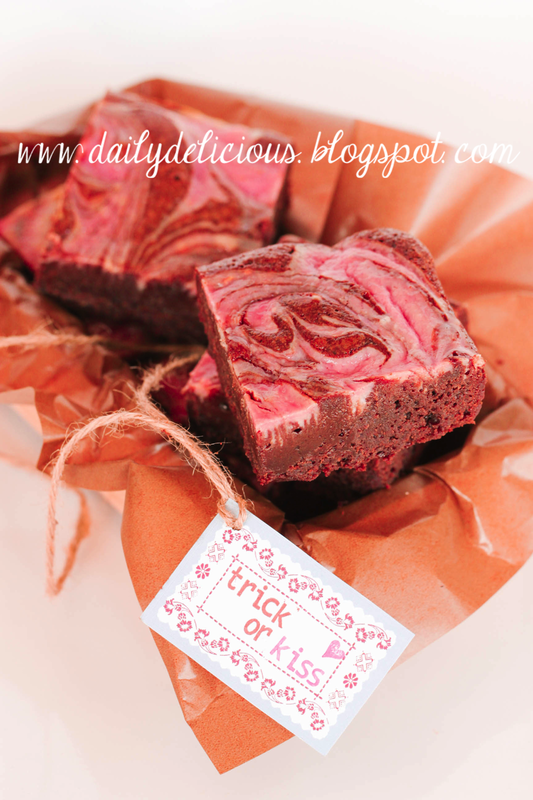 Halloween is coming, actually for me making scary sweet is not my kind ^^, I love to do something cute instead, haha. 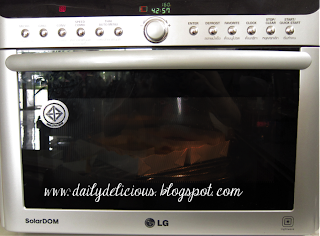 I got some email asking me about baking in LG SolarDom, I mean real bake not only from time to time or bake something simple, so from that day I started using my LG SolarDom a lot more for baking. All of the things came out good, (Note: I still didn't try the macaron), cookies, sponge, and cake, no problem at all. I think the thing that you need to know is the habit of the oven, for fan forced oven (convection oven), we need to reduce the temperature about 15-20°C from convention oven because the hot air will make the bake good dryer than simple oven. For the baking time it can be shorter or longer too, it's what you need to pay attention too, check the bake good after 3/4 of baking time and you will be able to control the result. For the LG SolarDom the largest size of the pan that you can use is 30x30cm , I think it's not too small for baking cake or cookie for small family, so if you ask me I think this oven is good for baking too ^^. 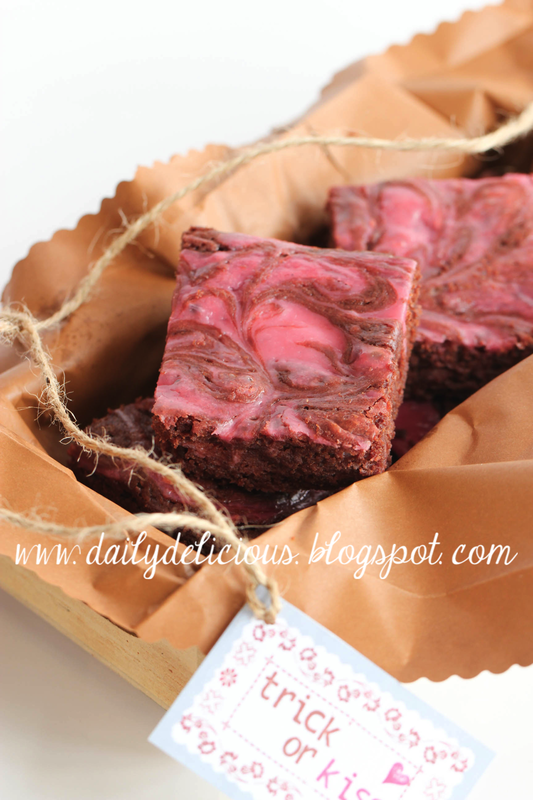 This time, I make the brownie again, you know that I can't stay away from chocolate, hehe, the other reason that I make is one of the reader asked me about making the raspberry brownie. I think it will be delicious and lovely if we make it in marble form. Rather than making something scary for Halloween, this one will be better. 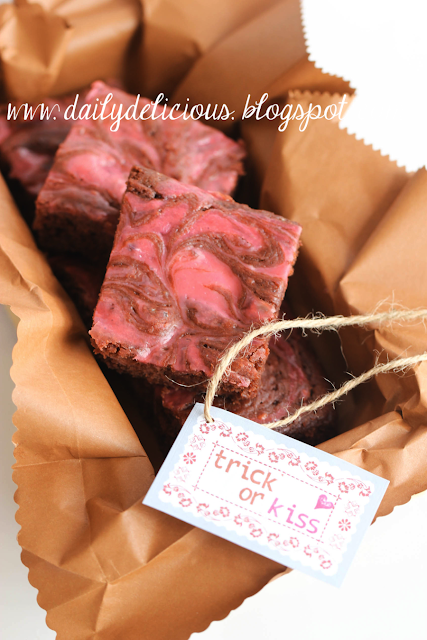 Making this lovely brownie and give it as a treat for someone you love, and don't forget to ask him or her that what do they want, "Trick or Kiss". 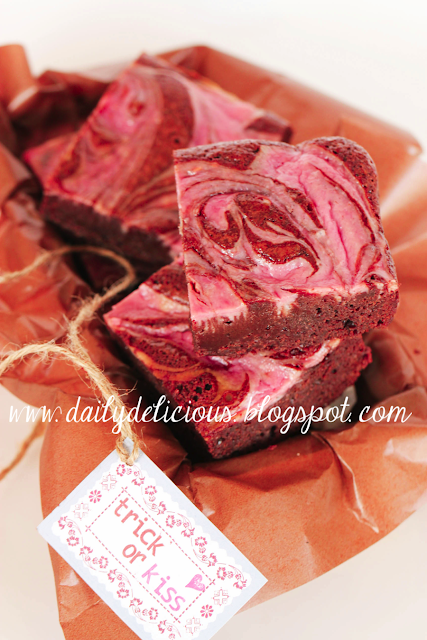 Line 23 cm square pan with baking paper. Beat all the ingredients together until smooth. Put the butter and chocolate into a microwavable bowl, and heat in the microwave for 1 minutes take the bowl out of the microwave and stir, if the mixture is not completely melt, heat again for 30 seconds. Pour the sugar and salt into the bowl and stir until combine, then let it cool down a bit (until you don't have to remove your finger quickly when touching it ^^). Beat the eggs together then pour into the bowl, stir to combine. 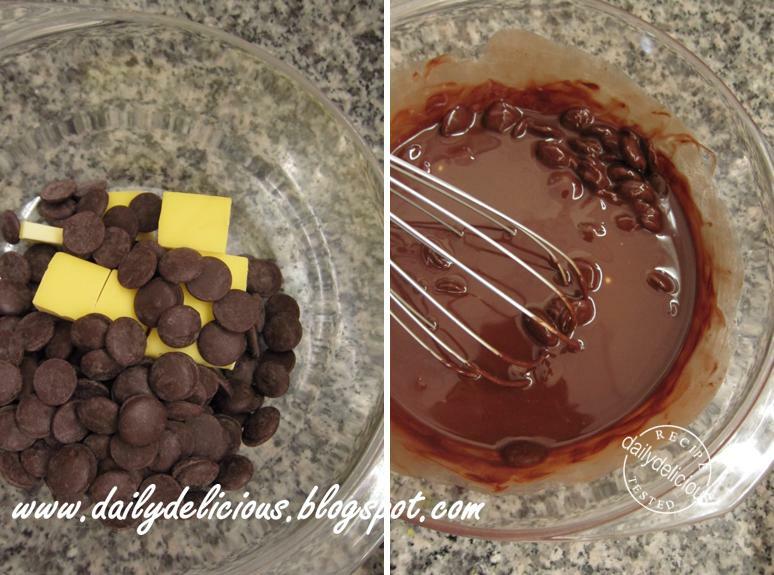 Sift the flour and baking powder together, then pour into the bowl, stir until smooth. 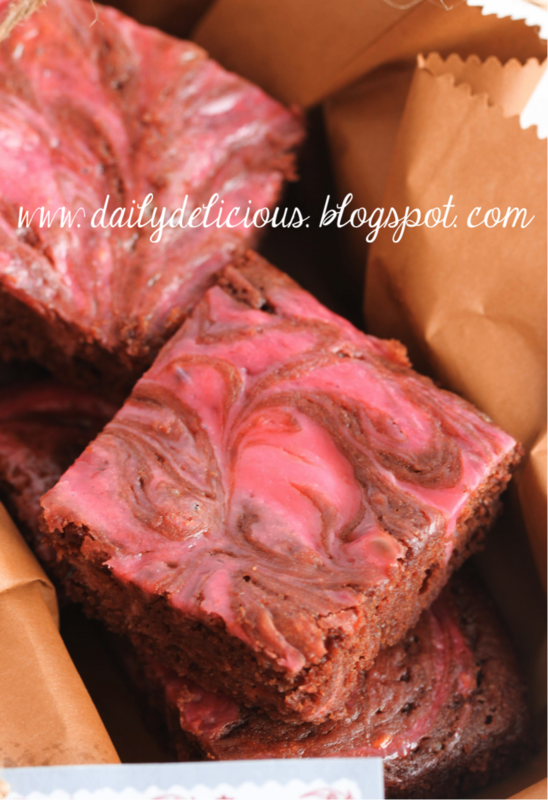 Pour the brownie batter into the prepared pan, spoon the raspberry batter on top and swirl bamboo stick or a tip of knife to create marble effect. Select the convection oven function, 160°C and preheat the oven for 10 minutes before baking. 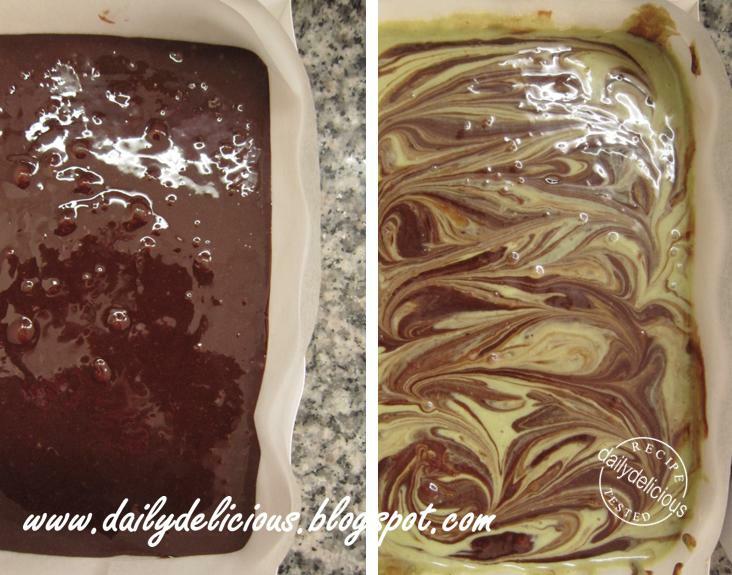 Bake the brownie for 30-35 minutes. * For Convention oven you need to bake at 180°C the baking time may be 40-45 minutes. Hi, it's indeed an interesting recipe I'd love to try it soon. 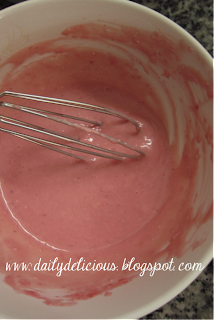 But, I dont know how to make the raspberry puree, can you explain it please? Hi, Karina Lestari, You can make it by put the raspberry in the blender until smooth and pass it through sieve to remove the seed.